In recent years an efficient design of a Wireless Sensor Network has become a leading area of research. A Sensor is a device that responds and detects some type of input from both the physical or environmental conditions, such as pressure, heat, light, etc. The output of the sensor is generally an electrical signal that is transmitted to a controller for further processing. A Wireless sensor network can be defined as a network of devices that can communicate the information gathered from a monitored field through wireless links. The data is forwarded through multiple nodes, and with a gateway, the data is connected to other networks like wireless Ethernet. 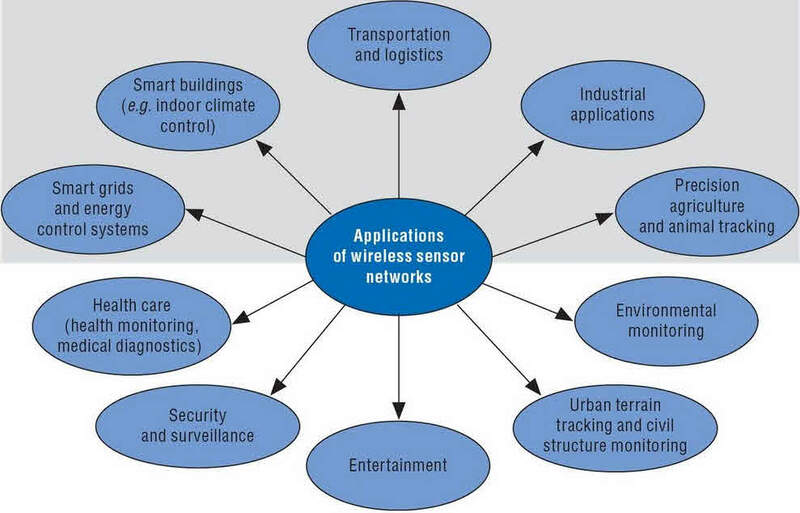 WSN is a wireless network that consists of base stations and numbers of nodes (wireless sensors).These networks are used to monitor physical or environmental conditions like sound, pressure, temperature and co-operatively pass data through the network to a main location as shown in the figure. For radio communication networks, the structure of a WSN includes various topologies like the ones given below. Star topology is a communication topology, where each node connects directly to a gateway. A single gateway can send or receive a message to a number of remote nodes. In star topologies, the nodes are not permitted to send messages to each other. This allows low-latency communications between the remote node and the gateway (base station). Due to its dependency on a single node to manage the network, the gateway must be within the radio transmission range of all the individual nodes. The advantage includes the ability to keep the remote nodes’ power consumption to a minimum and simply under control. The size of the network depends on the number of connections made to the hub. Tree topology is also called as cascaded star topology. In tree topologies, each node connects to a node that is placed higher in the tree, and then to the gateway. The main advantage of the tree topology is that the expansion of a network can be easily possible, and also error detection becomes easy. The disadvantage with this network is that it relies heavily on the bus cable; if it breaks, all the network will collapse. The Mesh topologies allow transmission of data from one node to another, which is within its radio transmission range. If a node wants to send a message to another node, which is out of radio communication range, it needs an intermediate node to forward the message to the desired node. The advantage with this mesh topology includes easy isolation and detection of faults in the network. The disadvantage is that the network is large and requires huge investment. 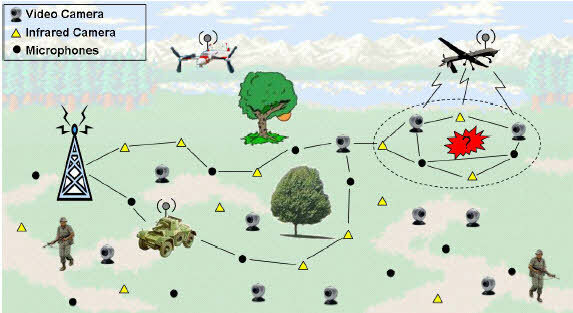 Terrestrial WSNs are capable of communicating base stations efficiently, and consist of hundreds to thousands of wireless sensor nodes deployed either in unstructured (ad hoc) or structured (Preplanned) manner. In an unstructured mode, the sensor nodes are randomly distributed within the target area that is dropped from a fixed plane. The preplanned or structured mode considers optimal placement, grid placement, and 2D, 3D placement models. In this WSN, the battery power is limited; however, the battery is equipped with solar cells as a secondary power source. The Energy conservation of these WSNs is achieved by using low duty cycle operations, minimizing delays, and optimal routing, and so on. 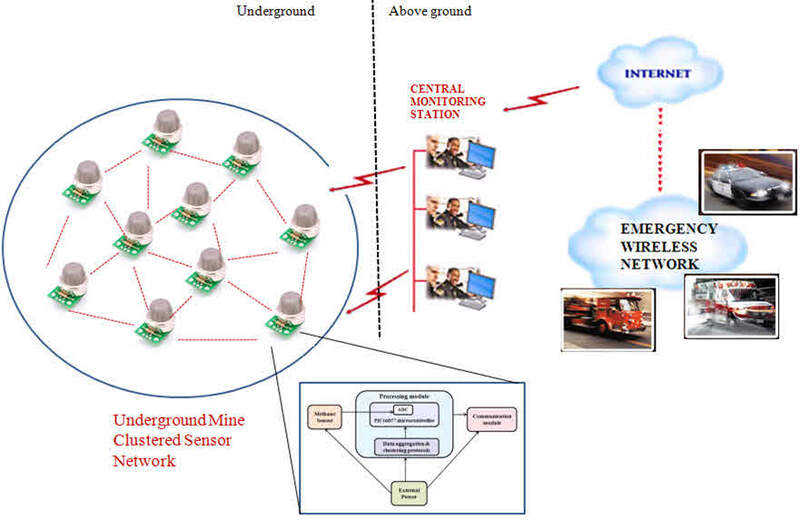 The underground wireless sensor networks are more expensive than the terrestrial WSNs in terms of deployment, maintenance, and equipment cost considerations and careful planning. The WSNs networks consist of a number of sensor nodes that are hidden in the ground to monitor underground conditions. To relay information from the sensor nodes to the base station, additional sink nodes are located above the ground. The underground wireless sensor networks deployed into the ground are difficult to recharge. The sensor battery nodes equipped with a limited battery power are difficult to recharge. In addition to this, the underground environment makes wireless communication a challenge due to high level of attenuation and signal loss. More than 70% of the earth is occupied with water. These networks consist of a number of sensor nodes and vehicles deployed under water. Autonomous underwater vehicles are used for gathering data from these sensor nodes. A challenge of underwater communication is a long propagation delay, and bandwidth and sensor failures. Under water WSNs are equipped with a limited battery that cannot be recharged or replaced. The issue of energy conservation for under water WSNs involves the development of underwater communication and networking techniques. 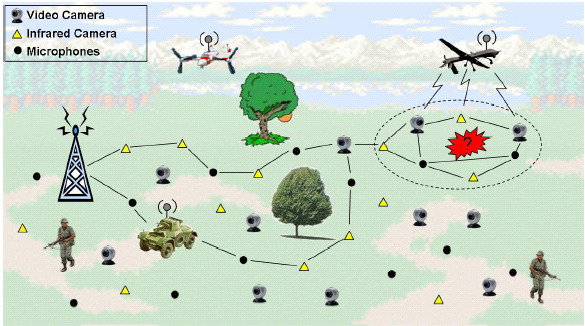 Muttimedia wireless sensor networks have been proposed to enable tracking and monitoring of events in the form of multimedia, such as imaging, video, and audio. These networks consist of low-cost sensor nodes equipped with micrpphones and cameras.These nodes are interconnected with each other over a wireless connection for data compression, data retrieval and correlation. The challenges with the multimedia WSN include high energy consumption, high bandwidth requirements, data processing and compressing techniques. In addition to this, multimedia contents require high bandwidth for the contents to be delivered properly and easily. These networks consist of a collection of sensor nodes that can be moved on their own and can be interacted with the physical environment. The mobile nodes have the ability to compute sense and communicate. The mobile wireless sensor networks are much more versatile than the static sensor networks. The advantages of MWSN over the static wireless sensor networks include better and improved coverage, better energy efficiency, superior channel capacity, and so on. These networks are used in environmental tracking, such as forest detection, animal tracking, flood detection, forecasting and weather prediction, and also in commercial applications like seismic activities prediction and monitoring. 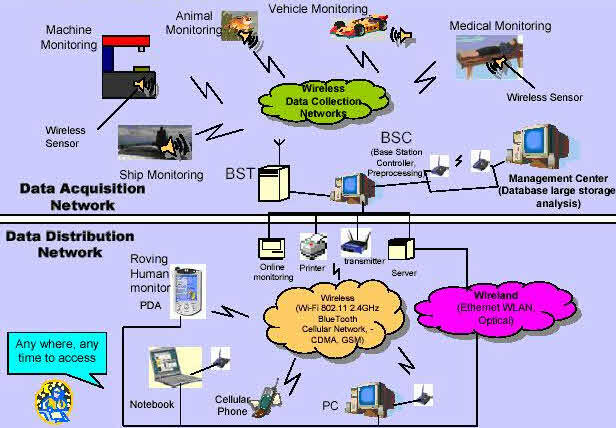 Military applications, such as tracking and environment monitoring surveillance applications use these networks. The sensor nodes from sensor networks are dropped to the field of interest and are remotely controlled by a user. Enemy tracking, security detections are also performed by using these networks. Health applications, such as Tracking and monitoring of patients and doctors use these networks. The most frequently used wireless sensor networks applications in the field of Transport systems such as monitoring of traffic, dynamic routing management and monitoring of parking lots, etc., use these networks. Rapid emergency response, industrial process monitoring, automated building climate control, ecosystem and habitat monitoring, civil structural health monitoring, etc., use these networks. This is all about the wireless sensors networks and their applications. We believe that the information about all the different types of networks will help you to know them better for your practical requirements. Apart from this, for additional information about wireless SCADA, queries, and doubts regarding this topic or electrical and electronic projects, and for any suggestions, please comment or write to us in the comment section below. You are my breathing in, I own few blogs and rarely run out from to brand.I believe this website contains some rattling excellent information for everyone. “Glory is fleeting, but obscurity is forever.” by Napoleon. Excellent post. Thanks for providing a nice article of information regarding WLSN types and its awesome applications. Nice style of presentation. Sorry Sumanth, we can’t give you PDF. Please visit our domestic website https://www.edgefxkits.com/ for interesting projects. please I need a project that solves a major (african) problem using control systems and 8051 microcontrollers. with details on how to go about it. Please follow the link: https://www.edgefxkits.com/communication-projects/ for projects based on communication Technology. Check the model numbers: 246,151,27,227,327,61,154,159 on the website http://www.edgefxkits.com for help. Please check the website http://www.edgefxkits.com for complete details in the kit content section and go through the FAQ for details.